We will be following Mrs Bennett and Miss Hilbert on the trip to Zambia this half term. While Mrs Bennett is away, Mrs Read will be teaching us all about Africa. We are starting the theme off with the story Handa's Surprise. I wonder what the surprise is ............? We will have the opportunity to taste a wide range of fruits as well as making a fruit salad. To link with maths we will be weighing and measuring the fruit using non standard and standard measurements, tally charts and pictogram's to find out what our fave' fruit is. We will be making Tinga Tale style works of art. This Term our theme is Medieval Magic. We will be looking at castles, kings and queens, dragons and giants. We are starting off with Jack and the Beanstalk. We will use the story to in true Pie Corbett style write our own version of the story. Was Jack right to steal from the giant? - we will discuss this during P4C sessions. We will be thinking about what Jack might see on his trip up the beanstalk. Do all beans grow? Our investigation into which beans will grow should be interesting! Do jelly beans and baked beans grow? What do plants need to grow? We will be learning how to tame a dragon and writing instructions for other wanna be dragon owners. Part of the theme will involve comparing modern days homes to homes in the past - what is the same, what is different? What would it be like to live in a castle? We will design and eat our own banquet after having a jousting competition in the school grounds. Who will be the winners? How to Trap a Giant. Are you kept awake at night by the sounds of giants saying Fee Fi Fo Fum? If so do not despair, help is at hand. Giants can be defeated. Read these instructions and soon you too will be rid of these terrible creatures! A magical shovel or pickaxe, a large, brown sheet, some leaves, sticks and plenty of money. First dig a deep pit. Then cover the pit with the large brown sheet. Next sprinkle the leaves and sticks on top. After that scatter plenty of money. Now tiptoe behind the beanstalk and wait. The giant will not be able to resist the temptation of the money and will therefore fall into the pit. Do not climb the beanstalk as there may be an enchanted castle at the top! Aliens have landed at Dinnington!!!!! At the start of the term we had an extraordinary visit in the Year 1 garden area - some aliens had landed and had a party! They had left a big mess everywhere, but it looks like they had a fab time. Unfortunately they left their alien babies behind. We became journalists for the day and began to write up reports on the alien landing. Later that week we received a letter from the grown up aliens asking us to look after the aliens until they could return to collect them. We made the alien babies comfortable beds for them to sleep in and put them outside ready to be collected. While we were walking back into school, a grown alien appeared and collected the babies. The aliens sent us another letter saying that they were very grateful for all our help. 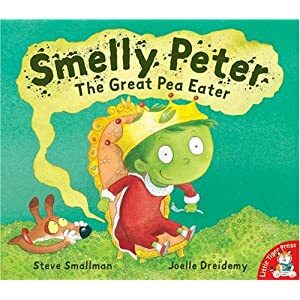 We have been looking at the book Smelly Peter, the Great Pea Eater. We used the Pie Corbett approach to writing to use the book as a stimulus for writing a newspaper report on Peter's (who loved peas - so he turned green) abduction from the planet Earth by the Krellians who took him to the Planet Krell because he was green and made him their king. Unfortunately Krellians fed him Krellian pies (which were not made from peas!!!!) and Peter turned pink again, so the aliens dumped him back on Earth. We took it in turns to be Peter, his mum or a Krellian alien and interview each other to get quotes for our news report; we looked at writing eye catching headlines for our reports and learnt how to write an introduction using the 5 w's - When, who, what, where and why. Recently, Peter - aged 10, was returned home after being kidnapped by aliens. He was taken to the planet of Krell, where the aliens made him king because of his green skin. Peter added that he was pleased to be home and had rather taken a liking to baked beans instead. After we have learnt how to write a report based on Smelly Peter, we then adapted our newspaper writing plans and wrote a report about the alien landing at Dinnington. CRASH LANDING - ALIEN BABIES FOUND! Last week, just after dinner time, there was a massive crash in the Year 1 garden. Some aliens had landed and had a party. Unfortunately the grown up aliens left the baby aliens behind. Yesterday, Miss H told us 'I looked after the baby aliens until the grown aliens came back for them. I was a little bit worried that they would not be returned'. 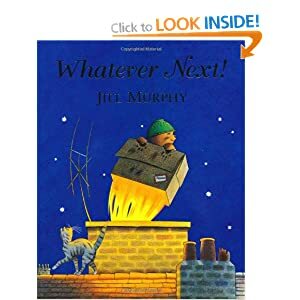 Over the next few weeks we will be reading the story 'Whatever Next' by Jill Murphy. It will inspire us to write our own stories. This term we are going on our Space Travels and exploring the galaxy. We will be learning about the planets and discovering some interesting facts about them. We will use this information to help us invent our own new planet. Using this we will be able to write non chronological reports about the new planets. We will also be looking at Aliens Love Underpants, to inspire us to create a new species of aliens that will live on our invented planet. As part of this we will design new underpants for the aliens. We will be learning the names of the planets and finding out how many moons they have, etc. Finding out who was the first person on the moon, discovering what life is like on the moon. Gung hay fat choy - In 2013, Chinese New Year is celebrated on February 10. In the Chinese calendar, it is the year 4710, and the Year of the Snake. We are celebrating Chinese New Year as a whole school this week. We have a range of visitors coming in to school to help us learn and celebrate. The week will end with a lantern festival and a presentation of our learning. 2013 is the year of the snake. Autumn Term 1: Wild Things. Our theme this term is Wild Things. We will be discovering more about animals, the environment and habitat, what they eat and drink. We will be creating fact files & Top Trump Cards, making an poster/advert/tourist guide for the wildlife park, writing a newspaper report about our trip, descriptive poem writing and debating & discussing animals and zoos. This term's theme is Sea Life. The term will start off with our annual Picture This competition, the theme is Landscapes. We have explored pointillism to produce our paintings. We were also exploring our colour mixing skills, looking at mixing primary colours to make secondary colours. We had to use different fingers to paint the dots on the picture, this created different sized dots. Some of us created a foggy forest scene, layering tracing paper to create the fog and painting different landscapes on each layer. Week three will start our Sea Life theme. In literacy we will be looking at stories. We will use Pie Corbett's story telling work to write our own story of Mr Benn. On Friday we will be having our WOW day at The Deep in Hull. This will help us prepare for our information text writing. We will end our theme with a pirate WOW day exit point. As well as all this, we will be practising for our Christmas Play, Children of the World and making things for the Xmas Fayre! What a busy term!